Although I love working on my own designs, creating custom orders is something I enjoy as well! I’m always impressed with the fantastic ideas my customers send my way. Working on custom designs can be a great way to blast myself out of a rut and get the creative juices flowing again. What are some possibilities for custom jewelry? You name it and I’ll do my best to create it! Possible media include, but are not limited to, polymer clay (charms, pendants, beads), beads (glass, crystal, gemstones, wood, etc), and sterling silver (wire-wrapped, hand-sawed and soldered). Your custom design may be something wild and one-of-a-kind that you dreamed up. Or perhaps you looked through my “sold” section and found something you’d like me to make again. Or it could be a new twist on an old design. For now, I am able to make small quantities. If you have a question about consignment or wholesale, shoot it my way and I may be able to help. Here are some examples of custom work I’ve done. 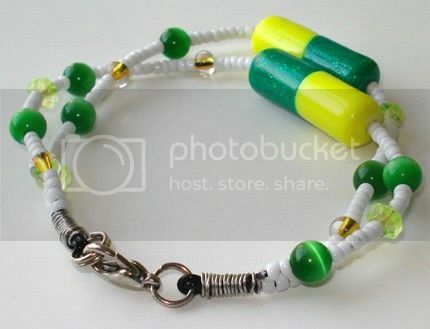 Inspired by my pill beads, Nicole requested a Prozac-themed bracelet. She left most of the design work to me – ahh, artistic license! Existing pieces can be a jumping-off point for new designs. 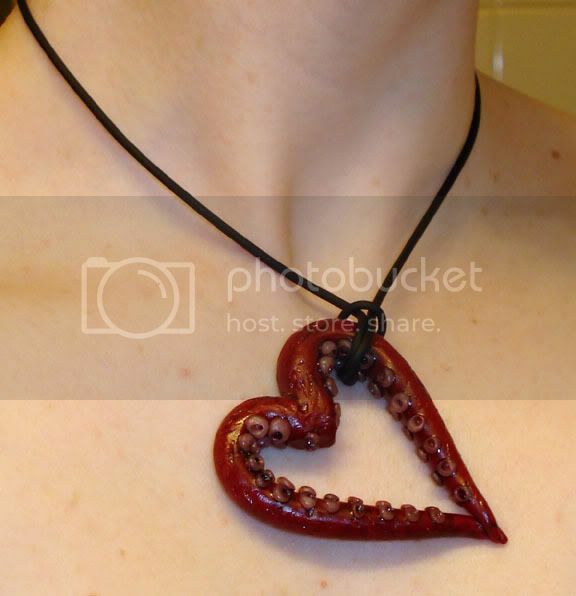 Missy liked the idea of my tentacle necklaces, but wasn’t a heart kind of girl. 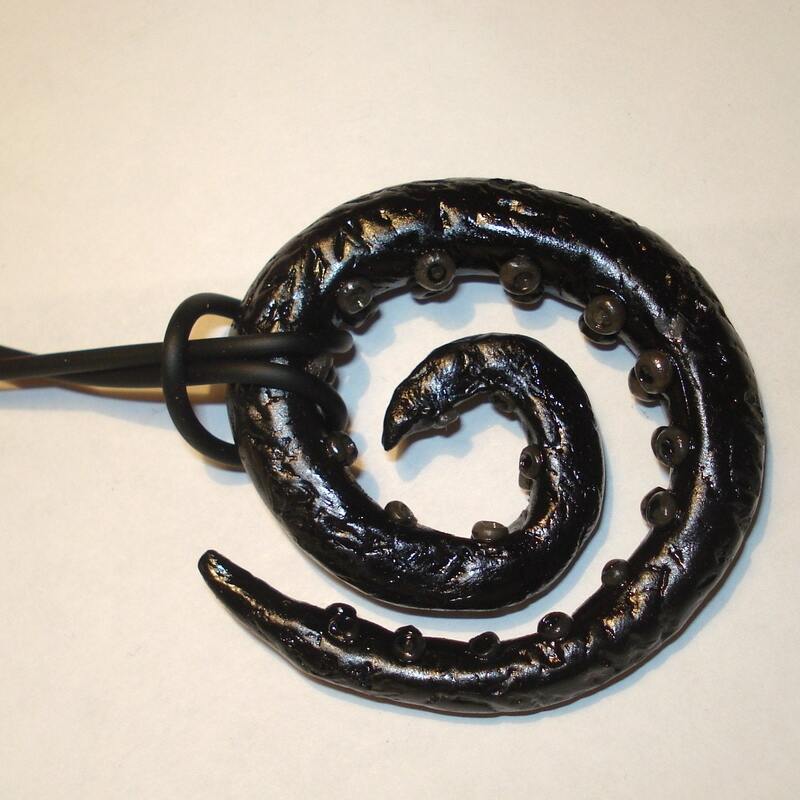 For her I created a custom black tentacle spiral necklace. Same idea, different execution! 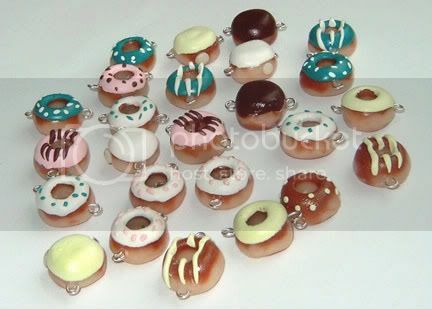 Detria saw my donut beads and asked for her own batch in custom colors, with sterling silver findings. These will be a delicious addition to her jewelry. 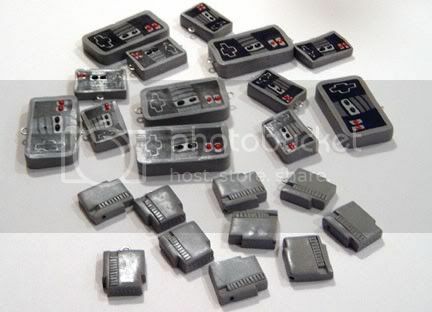 Cassandra was familiar with my polymer clay work, and challenged me to create some Nintendo-inspired beads and charms. I was up for it (and the PacMan music was stuck in my head for days)! Chris’ wife is a dentist. He ordered a set of five cavity tooth pins for her and her whole office staff. How’s that for a reminder to brush! 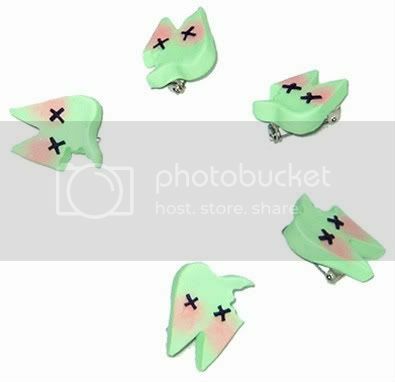 Check out Gearbunny’s sold items and LapinJade’s sold items for more custom order ideas.